Add some rustic country charm to your home this holiday season with this handmade wooden, primitive Mr. Jolly. Perfect for adding some personality to your Entry Way, Living Room, or Front Porch. This snowman features a matching scarf with a metal rustic star accent piece and a piece of twig pine on his hat! his rosy cheeks will bring joy to any home or garden area around the Winter Time!! 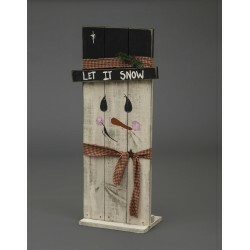 Add some rustic country charm to your home this holiday season with this handmade wooden, primitive Mr. Jolly snowman. Perfect for adding some personality to your Entry Way, Living Room, or Front Porch.